The Greater Lansing Convention and Visitors Bureau (GLCVB) is excited to join the rest of the community in welcoming the latest Gillespie Group development to downtown Lansing. 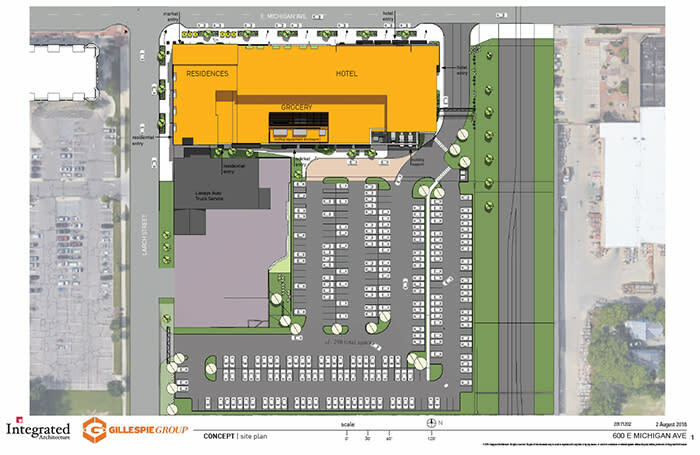 The massive 150 thousand square foot development will occupy a 4.15-acre portion of land on the 600 block of Michigan avenue, kitty corner from Cooley Law School Stadium.The development is slated to house thirty-six 1 and 2-bedroom apartments, a hotel, a 5,000 square foot restaurant/bar and a grocery store. The project will break ground Spring 2019 and is scheduled to be complete by the end of 2020. The grocery store, an urban market concept by Michigan grocery giant Meijer, will be a 37,000 square foot store on the south east corner of Michigan and Cedar street. The hotel, which will have anywhere from 120 to 140 guest rooms will be owned and operated by Concord Hospitality Services in Raleigh, North Carolina. The specific hotel brand will be announced at a later date.